as a hunting & fishing hideaway. This one bedroom cabin has a queen-size bed. with a microwave and refrigerator. Continental breakfast is served every morning ! Backwood Acres is just minutes from the Kentucky Motor Speedway and the Ohio River. You can be assured that you wont run out of things to do and sights to see during your stay! Book Multiple Nights and Save! Contact Us to book your stay and don't forget to inquire about our specials. We offer a 2 acre pond for fishing and 80 acres of secluded woodlands for walks through the woods. View our Gallery to see all that we offer. 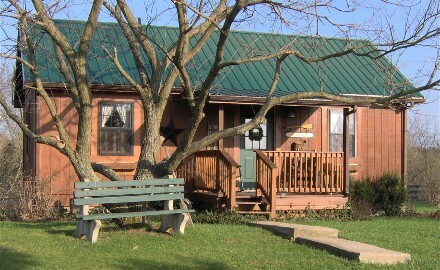 Backwoods Acres is now happy to provide our guests with High Speed WiFi Internet Access.